Transparency Market Research (TMR) has published a new report titled, “Global Toxicology Testing Services Market Global Industry Analysis, Size, Share, Growth, Trends, and Forecast, 2018–2026”. 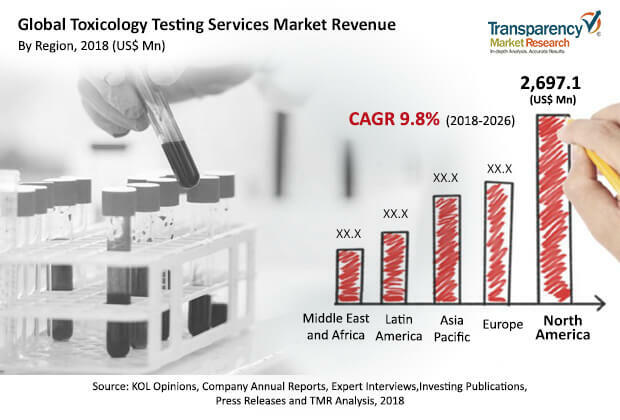 According to the report, the global toxicology testing services market is projected to reach over US$ 15 Bn by 2025 expanding at considerable CAGR from 2018 to 2026. North America is expected to dominate the global market due to the presence of a large number of companies involved in new drug discovery and development activities, stringent regulations by FDA regarding toxicological screening of drugs before entering into human trials, increase in trust and expertise of CROs providing toxicology testing services leading to increase in outsourcing of preclinical procedures, and rise in R&D expenditure of leading companies involved in drug discovery and development process. The report offers detailed segmentation of the global toxicology testing services market based on method and industry type. In terms of method, the market has been segmented into in vivo method, in vitro method, and in silico toxicology testing methods. The in vitro and in silico methods are considered as new approaches to reduce animal use in discovery activities. Thus, these two segments are anticipated to expand at a significantly high growth rate by 2026. These new approaches are considered as reliable, reproducible, faster, and economical options for safety assessment. Outsourcing of R&D activities to contract research organizations is increasing due to the rise in the number of CROs offering huge portfolio of toxicology testing services at reasonable price. Moreover, these CROs have expertise in this particular areas, which hastens the drug development process, thus benefiting these industries to achieve leading market place in various therapeutic areas. Moreover, due to outsourcing of toxicology studies, these industries are able to focus on their abilities and they accordingly manage their R&D cost. These factors are projected to drive the pharmaceutical and biotechnology companies segment of the global toxicology testing services market. Expansion of the footprint of leading service providers in Asia Pacific to cover leading players involved in the drug discovery and developments, growing collaborations among drug discovery industries with CROs, and increasing awareness among the consumers in this region regarding toxicity caused by various chemicals, and changing regulatory requirements of the government agencies operating in this region are the factors expected to boost growth of the global toxicology testing services market in Asia Pacific region from 2018-2026. For instance, in July 2017, Eurofins Scientific, a global leader in bio-pharmaceutical product testing services announced acquisition of Advinus Therapeuticsm, an India-based company engaged in preclinical and clinical phase contract research companies such as Safety Assessment, DMPK, CMC services, and Analytical R&D Services.